LIMA (Reuters) - Peruvian President Ollanta Humala's approval rating fell in September for the seventh straight month to the lowest level of his term, amid a wave of criticism for unfulfilled promises and a perceived rise in crime, according to a poll released on Sunday. 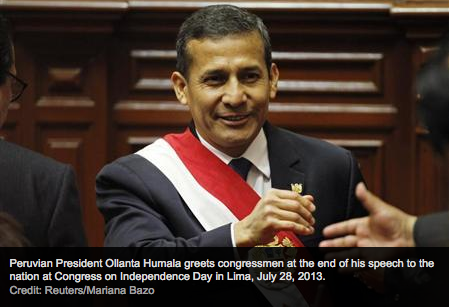 The popularity of Humala, who has been in office a little over two years, slipped to 27 percent in September from 29 percent in August, pollster Ipsos said. His approval rating has plummeted 27 percentage points since March. "Just like with his predecessors, President Ollanta Humala suffers from a constant deterioration in the approval of his administration. Similarly to prior cases, citizens complain of unfulfilled promises," Alfredo Torres, Ipsos director, was quoted as saying in El Comercio newspaper. Humala, a former military officer who abandoned his leftist rhetoric before becoming president, has put in place a variety of social programs, but has been criticized by some detractors of not doing enough. "Citizens are demanding that the government advance more quickly and efficiently in the development of large investment projects and pay attention to the most pressing social problems, especially security," said Torres. The Ipsos Apoyo poll of 1,200 people has a margin of error of 2.8 percentage points.